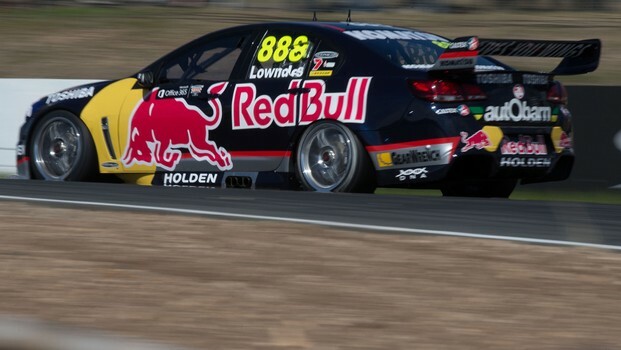 Craig Lowndes snatched a last-gasp lap to set the quickest practice time at Symmons Plains as Red Bull Racing continued to dominate the V8 Supercar series early season. Lowndes, the points leader after the opening round in Adelaide, set the fastest time of 51.379 with just seconds of Friday's final session remaining at the Tasmanian circuit. And teammate Jamie Whincup, who declared he's finally happy with his new-look Holden, made it a one-two for the Red Bulls. Fabian Coulthard, the New Zealander who won three of the four non-championship races at the Australian Grand Prix meeting, finished an impressive third fastest. And one spot back was another Kiwi – 21-year-old Scott McLaughlin, in his V8 Supercar debut season after winning the second-tier Dunlop series last year. Lowndes said his team continued to learn more about their cars following the radical 2013 rules changes and unlike Whincup, was again pleased with the Commodore's performance. And he hopes it continues with a chance this weekend to break Mark Skaife's all-time record of 90 touring car victories. Lowndes indicated records would tumble after his practice runs. "The car is different to drive, the rear end is nicer and we can run curbs a lot better than we have in the past," Lowndes said. "At the end we had a good run on the new tyre. We did struggle a little bit with traffic trying to get a lap but once we did get a lap the car was good." Lowndes said Red Bull was continuing to learn more about their cars' behaviour but there was still a lot of room for improved performance. "But we've come a long way in the two practice sessions we had and we've now got some things we can change in the car that we now will have an effect." Whincup said he was finally coming to grips with his car despite sitting second on the V8 points table behind Lowndes following the Clipsal 500 in Adelaide. He said there was "plenty of truth" to rumours he was unhappy with his car before the series started. "My car's been a bit of a handful. It's been trying to buck me off all year," Whincup said.